Thornless blackberries are trailing cultivars, meaning their primocanes will grow along the ground, like a vine, for two years after you plant them. Plant thornless blackberries in the spring, in a row with the plants spaced 4 to 10 feet apart. You may also enjoy success if you plant them in October, depending on where you live. Growing thornless blackberries requires patience during the first year, and attention thereafter to train the canes in a growth pattern along a trellis. Find and prep an area for your thornless blackberry bushes that has full sun and good drainage. Blackberries also prefer fertile loam soil, as opposed to clay or sandy soils. Improve your soil, if necessary, by tilling and mixing in organic matter. Blackberries grow best in soils with pH levels between 5.5 and 7. Add lime to increase the pH of your soil if necessary. Dig a shallow hole that will accommodate the roots of your blackberry bush; 4 to 5 inches is often deep enough. Prune away any dead or damaged roots, then place the plant in the hole and spread the roots. Cover the roots with soil, pressing firmly so there are no air pockets. Water the plant well. Cut the cane back to 6 inches if this was not already done by the nursery. 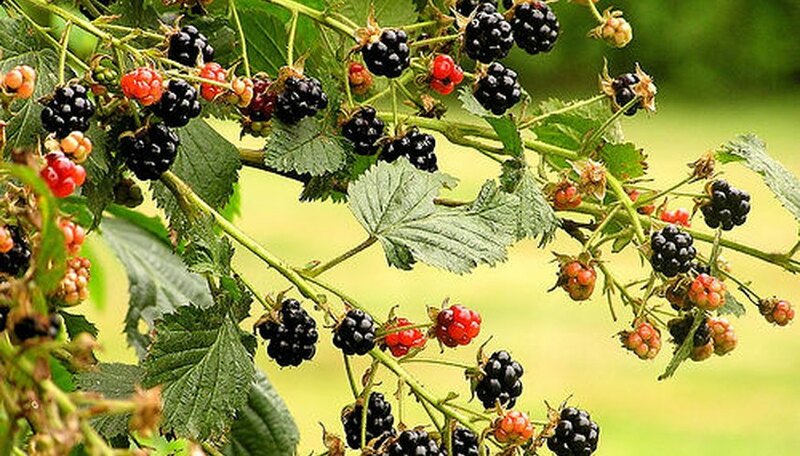 Your blackberry plant will not produce fruit the first year. Make a trellis for your thornless blackberry plants with two wire line, one on top of the other, stretched between wooded posts. As the plant begins to grow taller, tie the canes to the trellis with stretchy fabric. Ensure your blackberries receive 1 inch of water each week from the middle of June through the harvest. Depending on your location, you may begin harvesting blackberries as early as July and enjoy the fruit until October. Fertilize thornless blackberries in the early spring when new growth begins. Broadcast the fertilizer on top of the soil around the blackberries, or dig a trench that is 1 foot wide and 4 inches deep on both sides of a plant row for applying the fertilizer. Apply 5 to 6 pounds of 10-20-20 fertilizer for every 100 feet of your blackberry rows. Prune thornless blackberries in the fall, after the harvest, to remove old and dead canes. You can tie new cane growth that’s at least 4 feet long to the trellis system at this time. In the spring, prune any lateral canes back to 12 inches to encourage larger fruit. Do not plant your thornless blackberries where tomatoes, strawberries, peppers, eggplant, potatoes or other caneberries have grown in the past three years.